A trip to Paris would undoubtedly be incomplete if you miss out your visit to Angelina tea house. And if there’s only one to do there, it would be having a breakfast at Angelina tea house. Breakfast at Angelina tearoom can be a purely indulgent experience as Angelina definitely knows how to prepare one of the best breakfast. You can go for Angelina Breakfast and prepare yourself to be treated to a menu with a number of mouth-watering foods. You can choose tea, coffee or chocolat chaud of your choice and orange juice. You can choose from a selection of pastries, bread and salad. Eggs are also served and they can be prepared according to your choice. This entire breakfast menu will definitely fulfill your appetite. 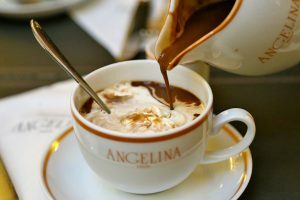 The famous chocolat chaud is a truly delectable drink, with a very posh name chocolat chaud à l’ancienne dit “l’Africain”. It is simply known as the old-fashioned hot chocolate. It is served with fresh whipped cream on the side, thus making this yummy and mouth-watering hot dessert definitely heart melting. If you prefer ala carte, then there’re some really good egg selections (omelet, scrambled eggs, eggs benedict) too, which are served from 9am onwards. Breakfast at Angelina Tea House can turn out to be one of your best experiences. Paris is charming and grand, and Angelina tea house surely illustrates this essence of Paris perfectly, but you would never understand this until you try it yourself.